Metso's stainless steel smart controllers were selected for close to 900 pneumatic actuated control, on-off and emergency shutdown (ESD) valves on the massive Goliat plant, which left the South Korean shipyard on Friday, February 13, 2015, for its home in the Barents Sea. The giant Eni Norge and Statoil owned Goliat floating, production, storage and off-loading (FPSO) plant is the first ever to equip all of its automated pneumatic valves with Metso's intelligent valve controllers to lower its operational and maintenance costs with predictive diagnostics. Goliat is the first plant in the world that has all of its automated valves equipped with a full range of stainless steel valve controllers from Metso. The client chose Metso to supply the smart valve controllers in order to enhance safety and minimize the operational and maintenance costs associated with its large number of valves. Metso's ability to bring intelligence to any valve makes it the best choice for the demanding offshore environment. The unrivalled third generation diagnostics and plug-and-play functionality of the stainless steel smart valve controllers convinced Eni Norge and Statoil that Metso could meet their targets. For Metso, this project represents its largest offshore delivery to date. "Our superior diagnostics is one of the biggest assets of our product portfolio. For operators, the easy-to-use graphic interface quickly shows them how a specific valve is functioning," says Juha Yli-Petäys, Head of Metso's Valve Controls business line. "Thanks to the constant valve condition monitoring, it is now possible to transfer maintenance work analysis to an onshore location, eliminating all unnecessary onsite servicing work. This is especially important in an offshore environment, where the costs of unscheduled maintenance can be incredibly high." All automated valves on the offshore platform will be under continuous online condition monitoring, enabling Eni Norge and Statoil to maintaining maximum control over the entire plant. Goliat, the world's largest FPSO plant, is due to be fully installed and operational by the end of 2015, approximately 100 km northwest of Hammerfest, Norway, in the Barents Sea. The colossal FPSO plant, owned 65% by Eni Norge and 35% by Statoil, will produce both oil and gas. With a diameter of 112 meters and a height of 75 meters, the plant is equipped with the world's latest technical solutions that enable it to operate reliably in the extreme Nordic cold climate and darkness during the harsh winters. 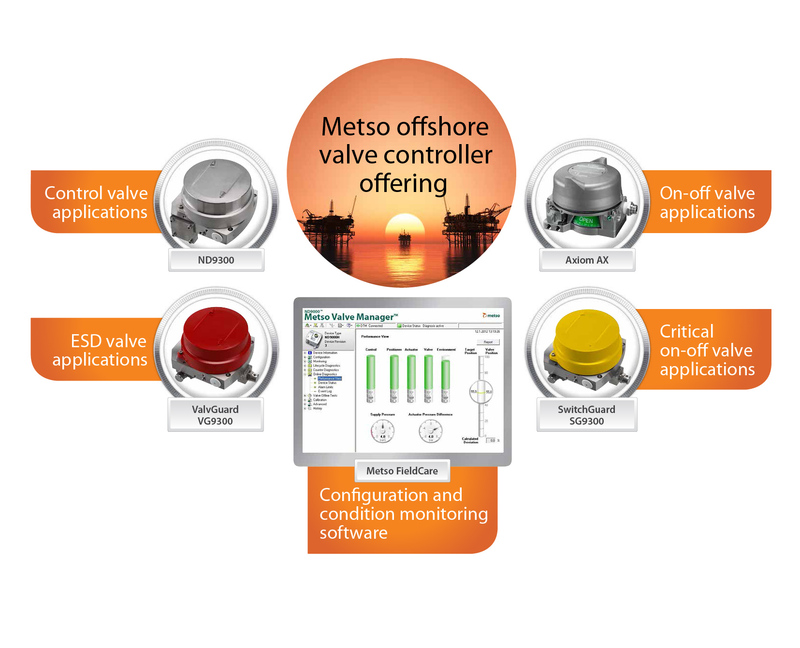 Metso has a unique and full range offering for control valves, critical and conventional on-off valves as well as ESD valves for oil and gas industries. Metso's stainless steel valve controller offering for offshore customers includes Neles ValvGuard safety valve controller and Neles SwitchGuard intelligent on-off valve controller, intelligent valve controller Neles ND9300 for control valve applications and Neles Axiom, controller for standard on-off applications. These products have already been selected for major projects like Total CLOV, Angola, Chouest in the USA, and Golden Eagle, UK. Metso's extensive flow control services offering covers business solutions and services that optimize equipment use and cost of ownership. Metso's valve technology centers and valve production facilities are located in Finland, the United States, Germany, China, South Korea, India and Brazil. Metso has over 40 valve and field device service centers worldwide. Metso has a solid experience in delivering engineered performance and reliability to the oil & gas, pulp & paper and power customers through its leading product brands - Neles®, Jamesbury® and Mapag® - and has delivered millions of control valves and on-off valves globally over the last 90 years. Metso's extensive Neles® control valve offering includes also standard and severe service globe valves, which offer reliability to most critical processes and operate at extreme pressures and temperatures. 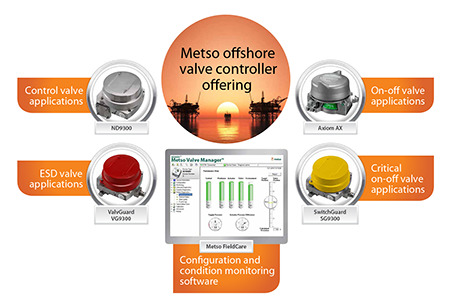 Additionally, Metso has become one of the leading suppliers of intelligent valve controllers. Metso is a leading process performance provider, with customers in the mining, oil and gas, and aggregates industries. Metso's cutting-edge services and solutions improve the availability and reliability in minerals processing and flow control, providing sustainable process and profit improvements. Metso is listed on the NASDAQ OMX Helsinki, Finland. In 2014, Metso's net sales totaled EUR 3.7 billion. Metso employs approximately 16,000 industry experts in more than 50 countries. Expect results.